so that their actions can be promptly induced. This, in return, increases user retention. To use a coupon, igawCommon SDK and igawCoupon must be integrated with each other. Go to Coupon > SDK Integration and verify the integration status of the app and SDK. Integration Info: Verify the app key and hash key to use for igawCommon SDK integration. 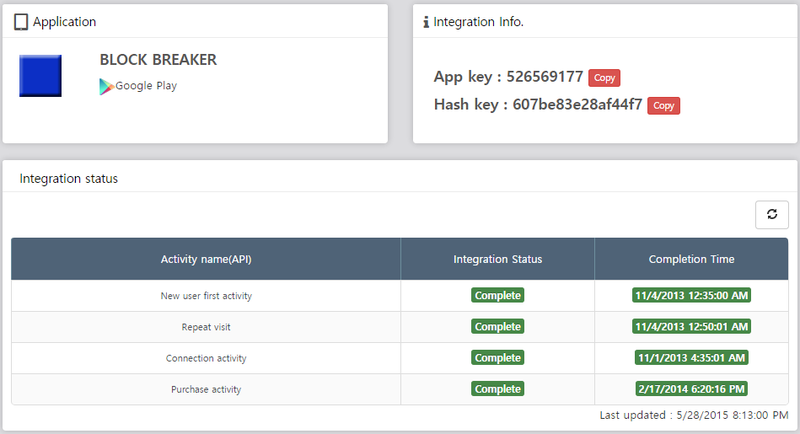 Integration Status: Verify the integration status of the Activity (API) within igawCommon SDK. Integration status becomes verified in real-time (in 10-minute intervals). Click the button to verify the status right away. Virtual currency Integration must be established to provide coupon rewards. 2-1. Go to Coupon > SDK & Virtual Currency Integration > Virtual Currency Integration page. 2-2. [Step 1] Register virtual currency: Start the virtual currency registration process. Register the virtual currency used in the corresponding app. Virtual Currency Image: Register the image of the virtual currency to be provided as a reward in the PNG file format of 70*70 pixels. 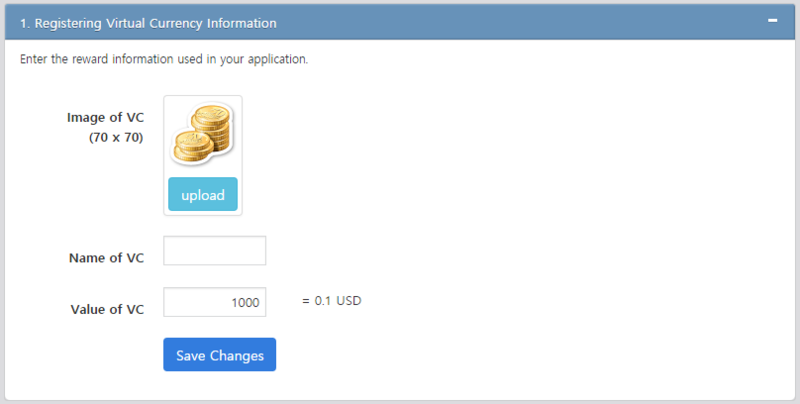 Currency Name: Enter the name of the virtual currency to register. Currency Value: Enter the value of the virtual currency that amounts to KRW 100. Save: Enter the details specified above and save. 2-3. 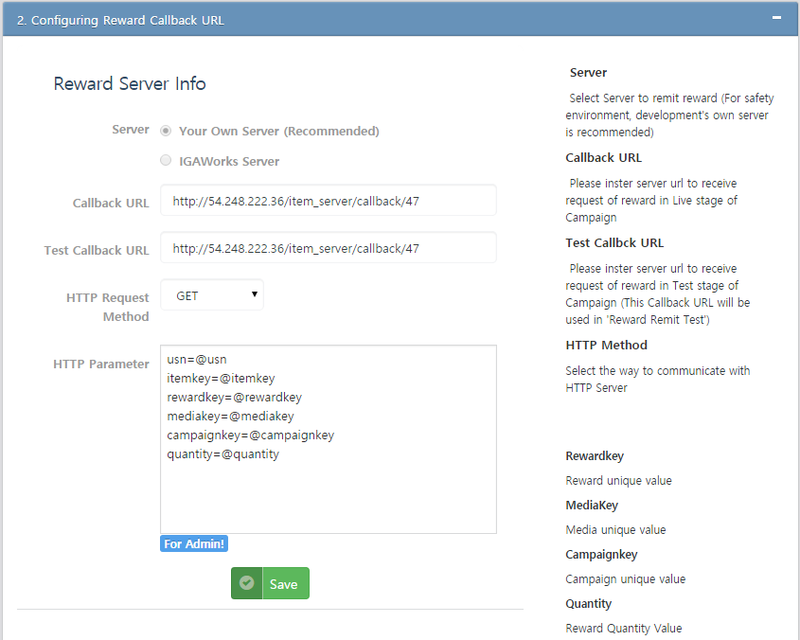 [Step 2] Set Reward Supply Callback Server: Transmit the reward information though the HTTP protocol and build the application server so that HTTP URL execution becomes available. Callback URL: Enter the real application server URL. Callback URL (Test): Enter the application server URL to use as a test. HTTP Method: Choose either GET (web document request from web server) or POST (client delivers data to web server). Save: Enter the Save button and proceed to the next step. 2-4. [Step 3] Test: Perform test no. 3 for virtual currency. Verify if the reward was provided properly and then check the conversion value to determine if the test was successful. Enter the USN value (user ID), and, verify the test results. 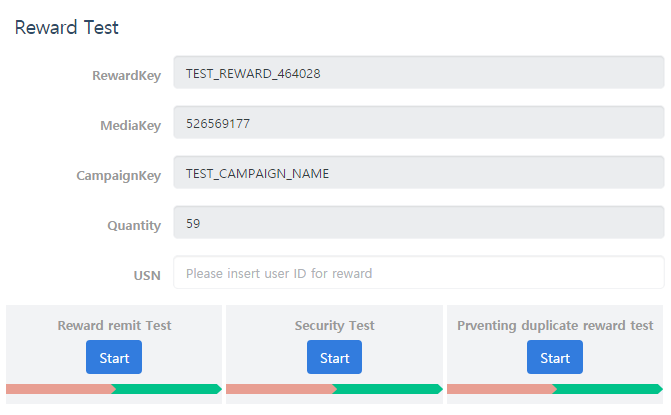 Security test for the IGAWorks coupon service is performed. To prevent unintended duplicate rewards, reward supplies are tested whenever there is a duplicate request. Enter the USN value (user ID), and, verify the test result. Coupons can be created if the integration between SDK and virtual currency is completed. Coupons are available in the serial number type and the daily coupon type. Serial Number Type: Generates countless numbers of coupons by creating disparate serial numbers for each coupon. - Serial number type coupons are the most common. - Expiration period, reward amount, coupon code digits, identification codes, etc. can be specified. - Campaigns are created according to the selected option. 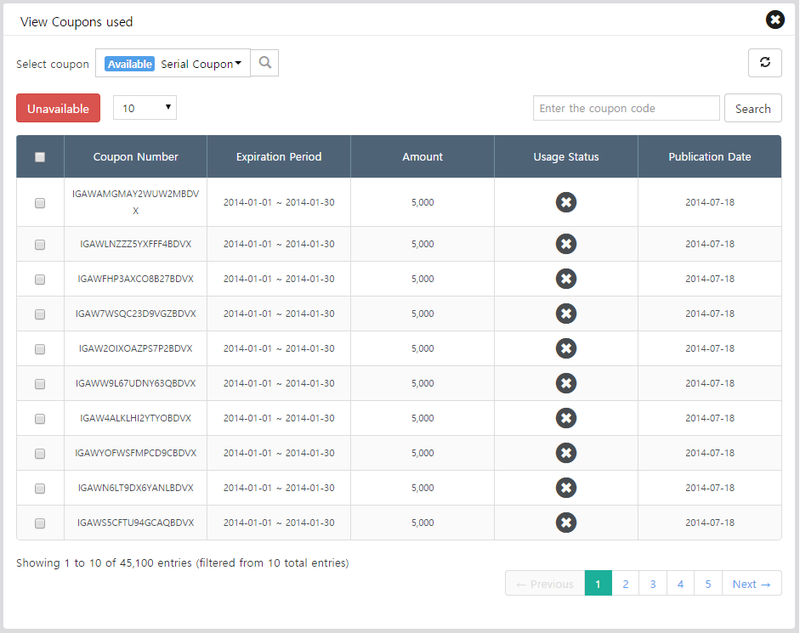 Coupons by sub-categories can be published from the dashboard. Daily Coupon Type: Generates one coupon with a single text string. - Unlike a serial number type coupon, a single coupon can be setup for consecutive uses. - Specific coupon validity duration can be specified and the coupon code can also be created. - 100 coupons can be specified for a single coupon code so that each user can use them 10 times. Campaign Name: Available for the admin. Up to 15 characters are allowed. Expiration Period: You can specify the expiration period when entering a coupon code. After the coupon code is published, you can verify the number of days left. Applied Price: Set a reward amount for a coupon code. Coupon Digits: Set the number of coupon code digits. Longer digits ensure increased safety but compromises user convenience. Prefix (Identification Code): Random characters can be used as a coupon code prefix. : Select this after entering the content above to generate a coupon campaign. Coupon Name: Enter the name of a coupon to use for the admin. Up to 15 characters are allowed. Expiration Period: Set the expiration period of a coupon. A specific time range can also be specified. Coupon Code: Up to 30 characters and numbers. 4-1. After a coupon is created, click the Publish Coupon button in the dashboard to proceed. Issue Coupon - Actual : Click the Publish Coupon button located in the coupon to publish the desired amount of serial number-type coupons. Issue Coupon - Test : Publish a coupon for testing. This is included in the report but won't be reflected in the reward calculation. 4-2. Normal Coupon will load the following popup. Enter the name and the quantity of a coupon (The same process applies to test coupons). Coupon Name: Enter the name of a coupon to use for the admin. Quantity: Enter the amount of coupons to publish. The remaining quantity is available for publishing. Generate a batch: Generates the specified amount of coupon codes. Remaining quantity: Set an amount to be issued out of the total 10,000,000 codes. A maximum of 100,000 codes can be issued at one time. Serial Number: The specified number of serial numbers are published. Coupon Code: The specified number of coupon codes containing serial numbers are created. Availability: Shows whether each coupon code has been used or not. ※ Coupon History: Searches for duplicate coupon usage in a created campaign. This will allow you to search for duplicate usage among the 10,000,000 codes. 5-1. There is no additional process to publish daily coupons. They can be used by incorporating the code that was registered. The code can be verified by clicking the Edit button. Go to Coupon > Dashboard and verify all published coupon data after being issued. Enable/Disable/Delete: Change the status of the selected coupon here. Disabled coupons can no longer be used. Track Usage/Report: Verify if the selected notice was used. Daily reports are also available for the coupons used. Copy Key: Verify the key value of the selected coupon, keeping in mind that the key value must be integrated. : Proceed to verify coupon status. : Create a new coupon. Report: Verify a report on the published coupon including the amount published, coupon usage, and rate of return. Click the View Coupon and View Usage button to verify if the selected coupon code was used. Select Coupon: Enter the name of a coupon to search for. : Enter the coupon code to view and click the Search button. You can verify if the selected coupon was used. 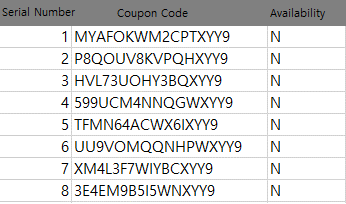 Expiration Period: Verify coupon expiration periods. 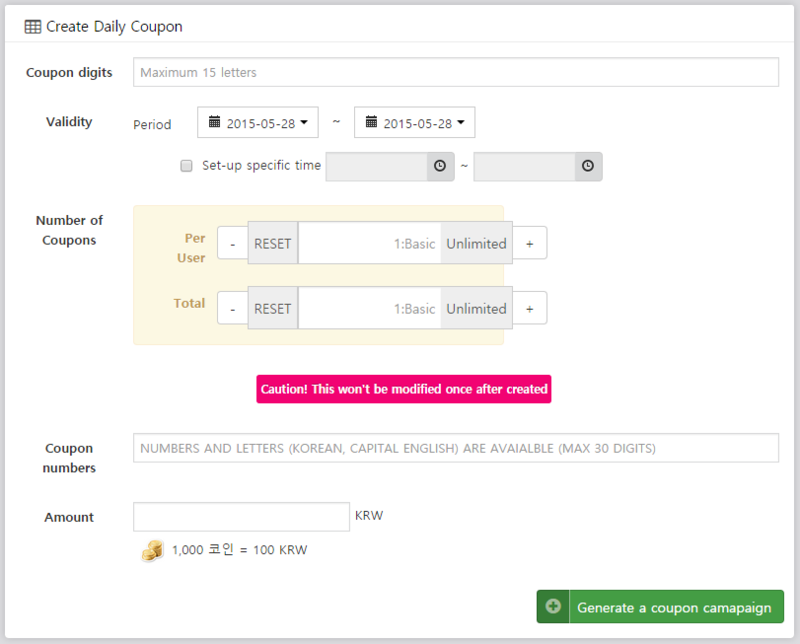 Amount: Verify the amount of rewards when entering the corresponding coupon. Usage Status: Verify if the respective coupon numbers were used. Publication Date: Verify a coupon's publication date. Click the Report button and view the amount of coupon usage and recovery rate in regards to time, date, and cumulative performance. Expiration Period: Verify the expiry period of the selected coupon. The remaining period (dates) can also be verified here. Usage Rate: Verify how many coupons were used in relation to the entire publication amount. 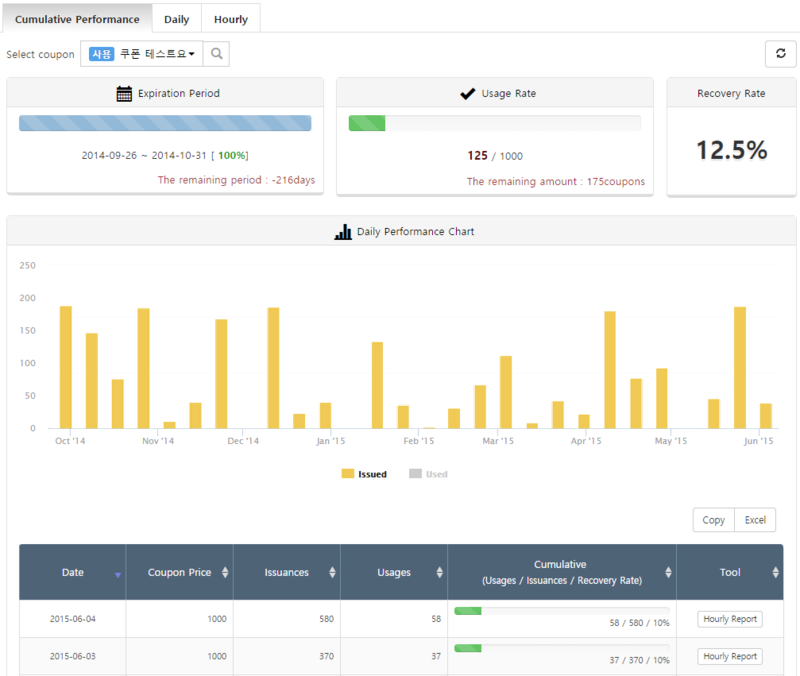 Daily Performance Chart: The amount of coupon usage by date is verified in the report form.